Back in the Anniversary update, Microsoft introduced a new beta feature called Bash on Ubuntu on Windows. With the Fall Creators update (v1709), the new module is now a stable feature and has a proper name called Linux Subsystem for Windows. The best part is, with the Linux Subsystem for Windows, you can run various Linux distros like Ubuntu, OpenSUSE, Kali, etc., by installing them directly from the Microsoft Store. If you are an avid Linux user then you may know Wine, a famous software that lets you run various Windows applications on Linux systems like Ubuntu. Linux Subsystem for Windows is very similar but allows you to run Linux directly on Windows. No, Linux Subsystem for Windows is not a virtual machine or a re-complied software like Cygwin. With Linux Subsystem for Windows installed, you'll be accessing the Linux terminal, run various commands, and install various Linux applications. As good as it is, there are some limitations. i.e, you cannot install GUI (at least officially) for your Linux OS and the Linux Subsystem does not support a few terminal commands and you may not be able to install or use certain commands and GUI applications due to inherent limitations of the Subsystem. However, for the most part, Linux Subsystem for Windows is pretty robust and gets the job done for a majority of users. One thing to keep in mind is that you should be running 64-bit Windows 10 operating system with Fall Creators Update (v1709) or above to use Linux Subsystem for Windows. Here's how you can install Linux Subsystem for Windows. Quick tip: To know your Windows version, press Win + R, type "winver" and press Enter. Before you proceed to install Linux Subsystem, save all your work. Your system will restart in the process. To install any Linux operating system like Ubuntu, you first need to enable Linux Subsystem for Windows. You can do that using PowerShell. 1. Search for "PowerShell" in the start menu, right-click on it and select "Run as Administrator." 2. In the PowerShell, execute the below command. It will enable the Linux Subsystem feature. 3. As soon as you execute the command, Windows will download any additional files it requires. Once downloaded, it prompts for your confirmation. Type Y and press Enter. 4. Now, Windows will enable the additional feature and immediately restarts your system. 5. You can now install Linux OS. 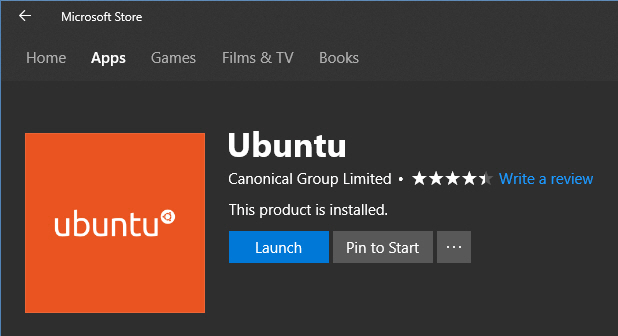 Just open Microsoft Store, search for Ubuntu and click on the "Get" button. This action will download and install Ubuntu. 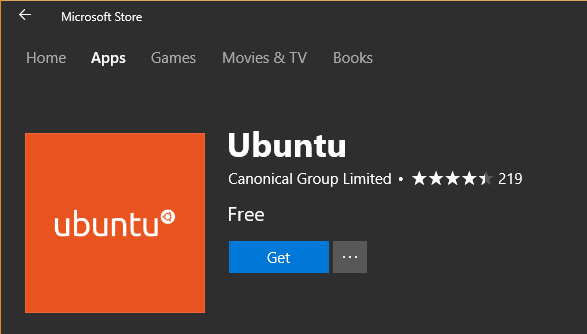 Apart from Ubuntu, as of writing this, Microsoft Store has other Linux operating systems like OpenSUSE, SUSE Enterprise Linux, Debian GNU/Linux, and Kali. You can install any of them by simply searching for them and clicking on the "Get" or "Install" button. 6. Once installed, launch Ubuntu by clicking on the "Launch" button or by searching for it in the Start Menu. That's all there is to do. It is that simple to install Linux Subsystem in Windows 10. Comment below sharing your thoughts and experiences about using the Linux Subsystem for Windows.